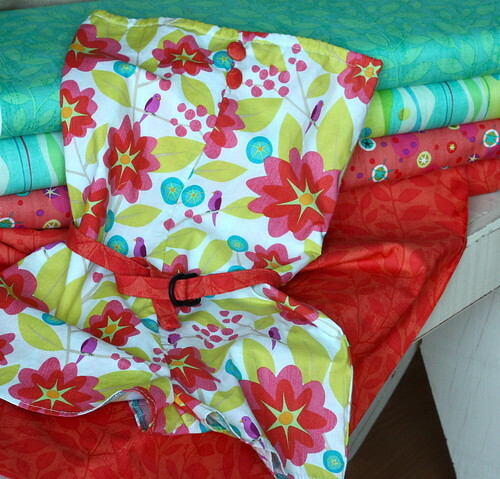 Welcome to Week 31 of the One Yard Wonders Sew Along! 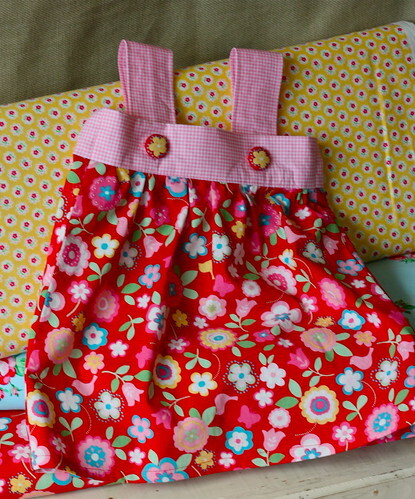 Cindy selected Flower Sugar Wildflowers Red and Michael Miller Fabrics Mini Mikes Tiny Gingham Pink. Cindy made the All Ages Classic Jumper in the 12 month size. Part 3: Cindy pressed the short ends as the directions said then she made a tube instead of pressing in the long ends & sewing. For her this method was faster and made a clean edge. Part 4: Cindy cut her interfacing to only cover half of the top front band. She was concerned the double layer would be too stiff. Part 10: As a beginner, Cindy found the wording on the buttonholes a bit confusing. She didn’t understand what a “vertical” buttonhole meant. By learning how her machine makes buttonholes she was able to figure out what to do to match the picture on page 191. The directions say to make the buttonholes “1 inch from the end of each strap”. 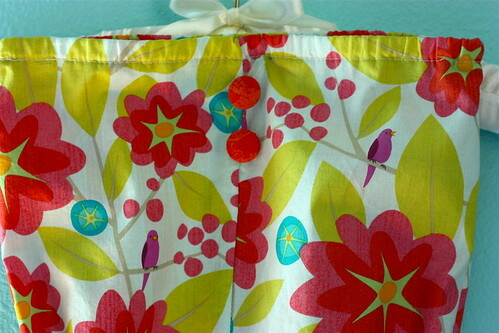 The picture shows the buttonholes on the front top band. Cindy matched the picture. Buttons were then sewn on the straps. Cindy thought this would be an easy way to adjust length to fit her granddaughter. She made covered buttons with some fussy cut flowers. This jumper will be super cute on Cindy’s granddaughter! Tracy chose Cary Phillips Floral Folio Large Toss Cream and Floral Folio Tonal Dark Orange. 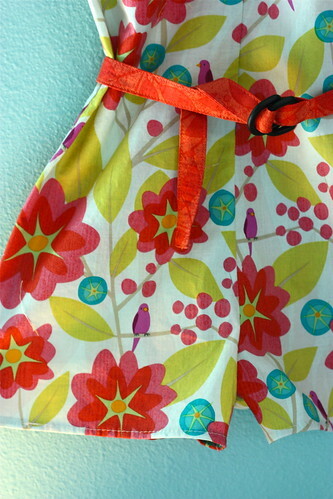 Tracy (and the Pink Chalk Team) was surprised to find this pattern was a romper not a dress. The darling picture in the book is a side view not showing the shorts. The pattern was simple and easy to follow. 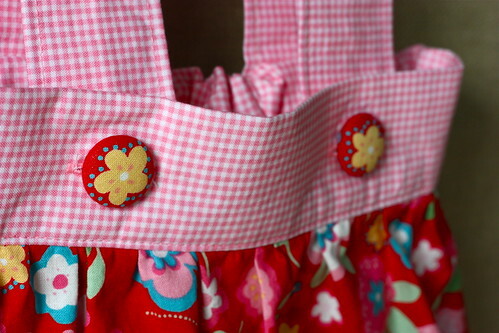 Tracy made her own buttons using the Pink Chalk Fabrics covered button kit. Two additions were suggested. 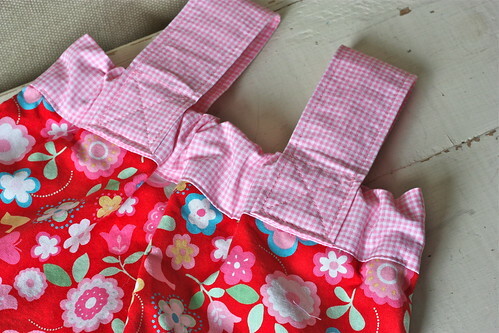 Belt loops to keep the belt in position and straps to secure the romper on an active child. Ready for a sunny day!